The upcoming phablet HTC Desire 8 which has been previously known by the codename A5 recently leaked in press renders and was also teased by HTC China. 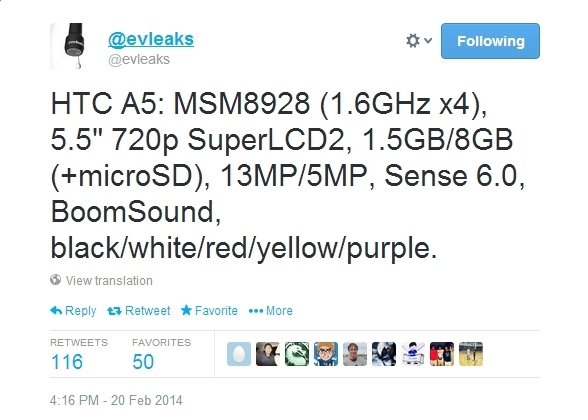 Now, the specifications of HTC A5 aka Desire 8 have leaked thanks to the ever reliable @evleaks. 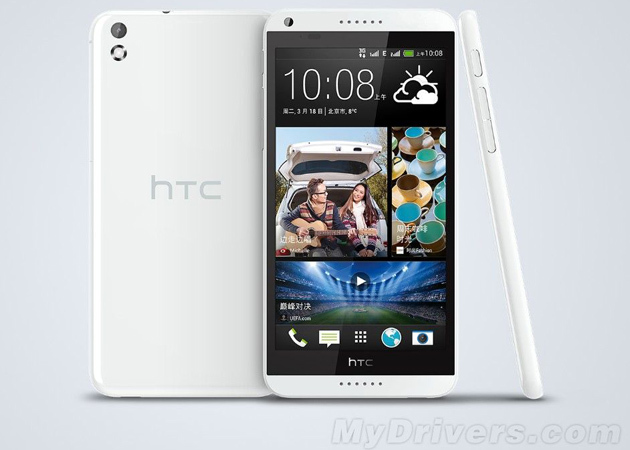 The HTC A5 aka Desire 8 is supposed to be the bridge between the upcoming 5-inch display packing New HTC One and the 5.9-inch HTC One Max. The Desire 8 comes with a 5.5-inch 720p Super LCD2 display. It will feature a Quad-Core Snapdragon 400 chipset with 1.5GB RAM. There’s 8GB internal storage along with microSD expansion. On the camera front, HTC has done away with the UltraPixel camera for the Desire 8 and the device will come with a 13MP rear camera and a 5MP front facing camera. The device will come with Sense 6.0 which makes us think that Android 4.4 KitKat will be on-board. There’s also BoomSound speakers in tow which we have noticed in the leaked images as well. The HTC A5 aka Desire 8 will come in a variety of colors: black,white,red,yellow and purple. The Desire 8 seems to be packing some good enough specs and a good design and the pricing will decide its fate on the market. HTC should announce the device at MWC although HTC’s next flagship, the New One is not launching at the event but at a separate March 25 event. Well, coming back to the HTC A5 aka Desire 8, we should bring you all the details from MWC so stay tuned.